The build process described on this page is a kind of "Self-Hosting." You use an existing version of Code::Blocks to compile the next version. When that version is proven to function correctly it is used to compile the next, and so on. A properly working Code::Blocks is required to compile the next SVN version. A: Nightly Build is a good candidate to use. It will be paired with a MinGW compiler in the next item. 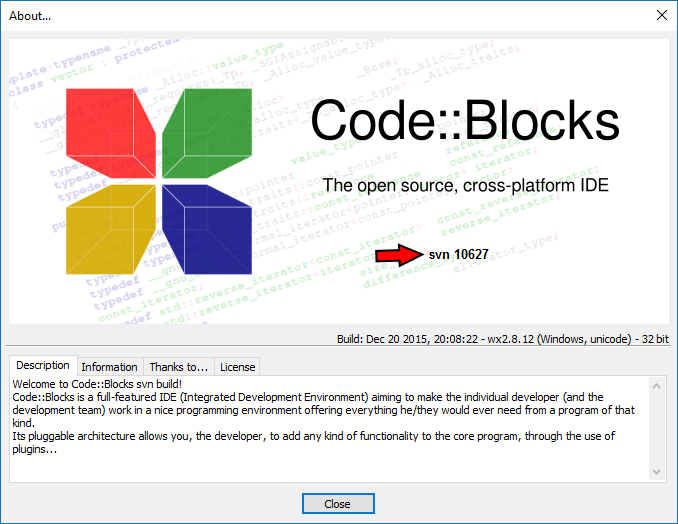 At the present time, Code::Blocks only compiles successfully with a MinGW compiler toolchain on Windows. You will need a complete, working: MinGW installation. wxWidgets is the "graphical user interface toolkit" that Code::Blocks is built on top of. ZIP and SVN functions are not required to run Code::Blocks but ZIP is required to build it and a SVN client is strongly recommended but not absolutely necessary. You will need a command-line zip.exe program. The recommended one can be found on the: Development Tools page. You do not need WinZip. Make sure zip.exe is in your PATH as it is used both during the compilation in your current version of Code::Blocks and also by the update.bat script. It is recommended, but not required, that you install a SVN client. If you are a absolute beginner in programming skip this part and go to Code::Blocks Sources. An example would be TortoiseSVN if you would like an all-in-one SVN solution. TortoiseSVN includes optional command-line client tools, which you should install as they provide a command-line SVN client. Choosing to install the command-line client tools will automatically add them to your PATH. However, if you do not wish to have the TortoiseSVN Explorer extensions in your right-click context menu or just don't feel a need for a graphical client in particular then you can use another: SVN command-line client equally well. Just make sure that whichever client you install has its executable in your PATH. The last item is to acquire the Code::Blocks source code. Follow the appropriate instructions for whether you have a graphical or command line SVN client. 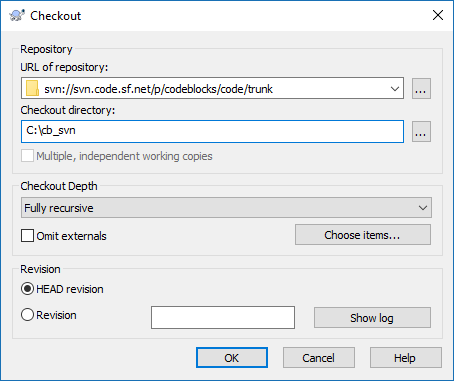 In the URL of the repository box, enter svn://svn.code.sf.net/p/codeblocks/code/trunk and verify the checkout directory is where you would like it to be. The example given here is "C:\cb_svn" - once satisfied with the arguments click the OK button to process the checkout. 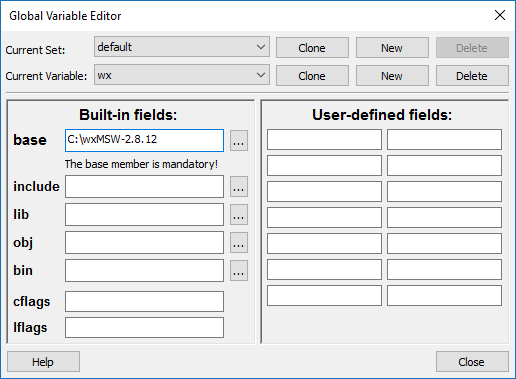 Unpack the wxWidgets zip file to a directory of your choice, open a command-line prompt, and navigate to the directory build/msw inside the wxWidgets directory. In this directory there is a text file named config.gcc which you can edit with notepad to control the build options. There are two lines to note, CFLAGS ?= and CXXFLAGS ?=. The options given here will go in either or both of those lines. 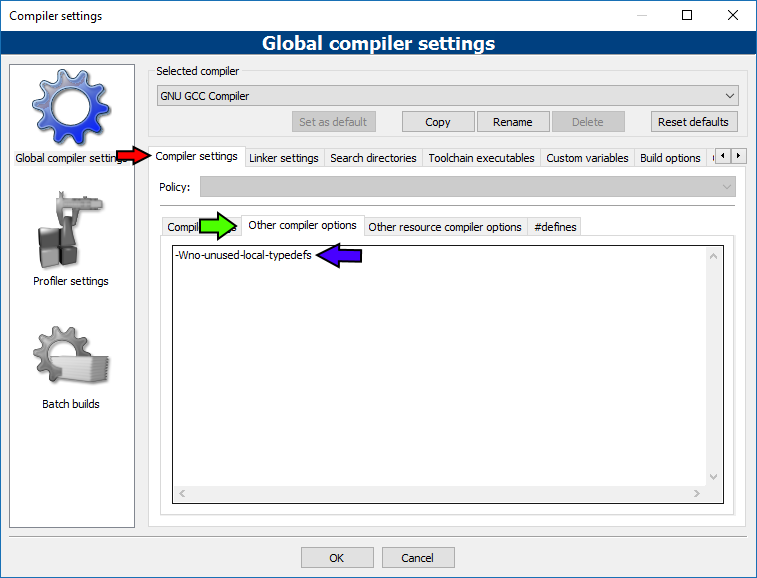 wxWidgets 2.8.12 will not compile by default with a 64-bit compiler. To make it compile with one add CFG=64 to the build line that is given next. This would be useful for your own 64-bit programs but the Code::Blocks project files do not have a 64-bit project that targets wxWidgets 2.8.12. To attempt to modify them so they do is beyond the scope of this guide. Where "X" is the drive letter, and "\path\to\toolchain\bin" is where your toolchain is located. If your compilation fails for any reason then make sure to run the clean line before trying again. All the preparation work is now complete and we can actually perform a self-hosting compile of the next Code::Blocks with our current one. 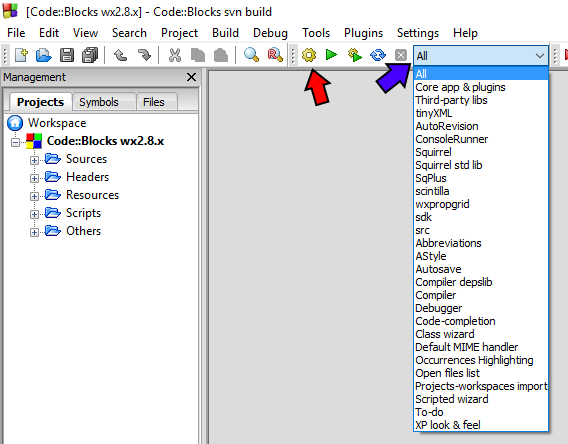 If you do not make any changes to your non-Code::Blocks prepared items, like your MinGW compiler version, and the wxWidgets library, then when building subsequent SVN versions of Code::Blocks you can keep all the preparation from a previous build and start with this section. When restarting from this point you can refresh your current Code::Blocks local source with TortoiseSVN. Right-click on your local source directory, go to "TortoiseSVN" in the context-menu, then choose "update to revision." The "head" is always the latest version. 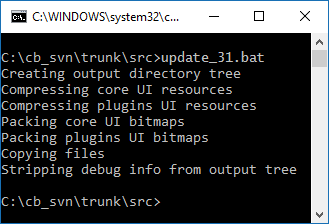 If you are using a command-line SVN, just run svn update in the root of your local source directory. Open the project file CodeBlocks.cbp. You will be prompted to define the global variable $(#wx). In the base field, enter the root of the location where you unpacked wxWidgets. You will also be prompted to enter the global variable cb_release_type. 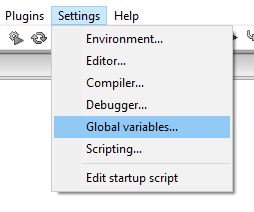 Here you can add compiler optimization or debug-flags. Enter -g in the base field as a default or any other options you require for your specific needs. 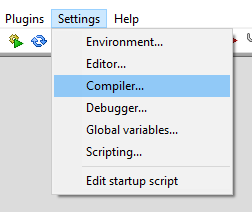 And under the "Compiler settings" tab (red arrow), "Other compiler options" sub-tab (green arrow), enter "-Wno-unused-local-typedefs" (blue arrow), and you may also add "-Wno-deprecated-declarations" on its own line here too. Make sure that "All" is selected as the target (blue arrow), and then click the Build icon (red arrow). If everything builds correctly your build messages should end with no errors. After the compilation has finished, copy lib\gcc_dll\wxmsw28u_gcc_custom.dll from the wxWidgets directory to the devel directory in the Code::Blocks src directory. The devel directory is created by compiling the Code::Blocks project in Code::Blocks. Run update.bat (located in the src directory). This will pack the resource files and copy the executables, libraries, and plugins to the output directory. It will also create the output directory if it does not exist. The stripped ("production") executable is found in output directory together with all libraries and data files. If you want a version with debug symbols instead (caution: huge size! ), use the one found in the devel directory. 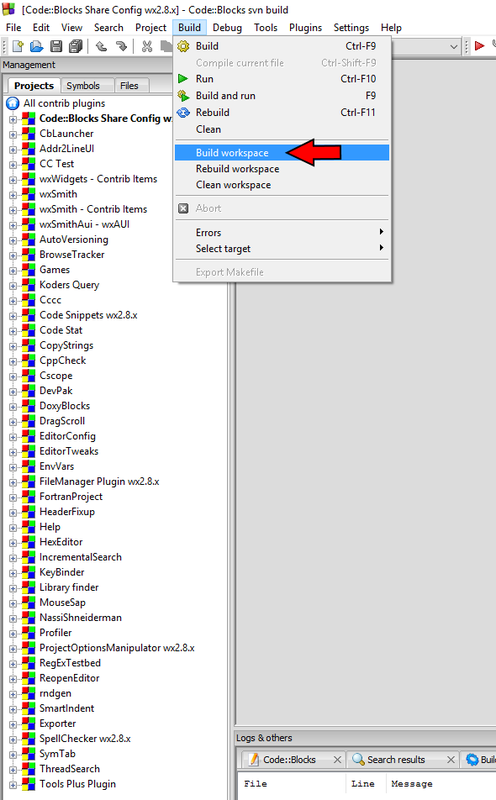 The workspace file ContribPlugins.workspace contains the project files for all contributed plugins. Open that workspace and compile the plugins which you would like to use (or select "Build workspace" from the Build menu if you want them all). The NassiShneiderman plugin has a dependency on the "Boost" library. If you do not wish to use that plugin and therefore not need the library, just right-click on that plugin and choose "close project." Don't forget to run update.bat again after building the contributed plugins. Copy or move the output directory to where you want Code::Blocks to reside. You probably want to rename the output directory to something else. You can also optionally right-click on codeblocks.exe and choose "create shortcut" and then rename that shortcut to your liking and move it to another location such as your desktop for easy access. 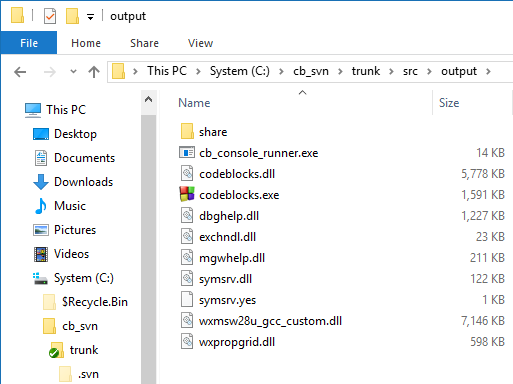 If you want to run Code::Blocks on a machine without your compiler toolchain being in the PATH then you will likely have to include, in the same directory as the codeblocks.exe is fine, support .dll files from your compiler toolchain. 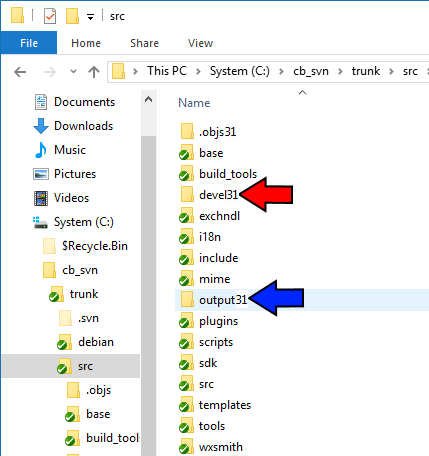 The easiest way to determine the required files is to not have your compiler toolchain in your PATH and repeatedly run Code::Blocks and copy over each .dll it says is missing until all have been found. This page was last modified on 25 August 2017, at 22:09.